When it comes to sports whereby there is a repetitive motion, it is important that the correct protection is used. With regards to both golf and tennis, there is continued pressure put upon the elbow. Due to this, a common condition known as tennis or golfers elbow occurs. This is actually inflammation of the tendons in the joint, otherwise known as tendonitits. In terms of treatment, the best course of action is to rest the joint since it will allow the tendons to heal. However, this can be difficult since this complete rest would mean that entire joint is not used. In order to get around this problem, a common approach is to use an elbow brace or band to support the joint. There are a lot of these braces available online, however, not all of these are of the high quality that is needed to help support the elbow. To that end, we have spent countless hours researching what the best bands and braces are and have narrowed down the results to one brace and one brand. The reason for this is that we feel that people will prefer one style of elbow support over the other. Having said that, both of these will work extremely well and they are the highest rated bands and braces on Amazon. 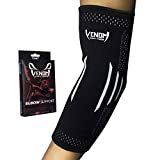 Venom have developed a truly exceptional elbow support brace that has helped over 2,500 who have bought it on Amazon. The brace is made up of highly durable elastic. The benefit of this is that it means it will still allow movement when needed, rather than being extremely restrictive like a cast would be. In addition to this, due to the it being composed of high quality elastic, it properly supports the elbow whilst also increasing blood flow to the area to help it recover quicker. As an added bonus, Venom also include a PDF with every order with a list of exercises to help you heal as quickly as possible. TARGETED COMPRESSION AND HEAT RETENTION: Designed for rehabilitation of joint inflammation, elbow tendonitis, tennis elbow, golfer's elbow, arthritis and general elbow pain. Our compressive sleeve will increase blood flow, reduce muscle swelling, and alleviate pain and discomfort. COMFORTABLE LIGHTWEIGHT DESIGN: Not only will your pain be reduced, but our sleeve will eliminate bunching and irritation so your movement will be unrestricted during physical and every day activities. 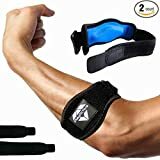 Perfect solution for tennis, golf, volleyball, football, basketball, softball, baseball, CrossFit, weightlifting and many other athletic activities. Playactive have developed a truly premium elbow band that wraps securely around your forearm, just below the elbow. It consists of a combination of nylon and neoprene which means it’s extremely flexible, but also strong enough to help promote repair of the damaged joint. This recovery is aided by having a flexible compression pad directly on the brace which provide support exactly where it’s needed. As an added bonus, there is a money back guarantee should it be the case that you aren’t happy with the brace. VALUE PACKAGE: Two Premium Elbow Braces, Two Extra Straps, Clear INSTRUCTIONS and a digital E-Guide are included in your purchase. The E-Guide will provide clear instructions on how to use our elbow braces and gives additional tips and insights in dealing with elbow pains. In addition, all purchases are backed by our world-class customer service and our no-questions-asked Money Back Guarantee. ELBOW PAIN RELIEF: If you suffer from Elbow Tendonitis, either Tennis Elbow ( Lateral Epicondylitis ) or Golfer's Elbow ( Medial Epicondylitis ), our support braces will provide immediate pain relief. People who suffer from Carpal Tunnel Syndrome or Arthritis can also benefit from wearing our braces. Recommended for all activities that could result in hyperextension of the elbow. Last update on 2019-04-21 / Affiliate links / Images from Amazon Product Advertising APIThis site is part of the Amazon Associates program and may receive a commission from any purchases you make from Amazon when clicking through to their site.